Milburn, NJ – Dr. Vladimir Gashinsky of Holistic Dental Center reveals a revolutionary and brand-new alternative to sedation dentistry, NuCalm® on “12 To Your Health” airing on News 12 New Jersey. The interview will be seen on February 13, 2016 and will repeat every hour on the hour. 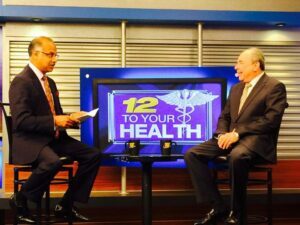 Dr. Gashinsky is appearing in 2 segments on News 12 New Jersey’s “12 To Your Health” where he describes this revolutionary, non-narcotic relaxation therapy, its benefits and how it’s helping patients with shorter and more relaxed appointments. Dr. Gashinsky is among the first dentists in the country using NuCalm therapy in his dental practice in Millburn, NJ, and is already achieving great results. “Patients who are normally tense or even stressed before or during dental treatment are now calm and relaxed. NuCalm is a natural alternative to sedation and therefore has no side-effects or toxic influence on the patients, ” says Dr. Gashinsky. To date, more than 300,000 dental patients across the United States have experienced a relaxing dental appointment with NuCalm. 98% of patients who have experienced NuCalm have stated they would recommend it to their friends and family. NuCalm therapy achieves deep relaxation through four simple steps. NuCalm is administered at the beginning of the appointment, and most patients experience deep relaxation within 3 to 5 minutes. While listening to soothing music, they will relax comfortably in the chair for the entire appointment. Once dental work is completed, the patient can leave the office immediately with no side-effects, no impairments and no recovery time. For more information on the NuCalm procedure, call the Holistic Dental Center at 973-379-9080.